Welcome to Canoe Creek Brethren in Christ Church where we seek to grow in obedience to God's perfect Word and in love with Jesus and each other. You will find our fellowship casual, friendly, honest, caring, and mission minded. We represent a variety of age groups, personalites, occupations, and music styles. We come from a variety of locations: Altoona, Hollidaysburg, Alexandria, Duncansville, Williamsburg, Cresson, and more. But we all have found a home of faith always full of laughter, warm friendship and delicious food. 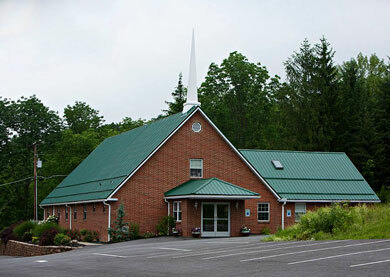 We come together to this simple but efficient meeting house for worship that is uniquely central and very necessary to us all. It's worth the quest to get here both in heart and in miles. We'd love to meet you and encourage you on your walk with the Father God as we keep in step with His Holy Spirit. We are across from Canoe Creek Lake in this beautiful mountainous area that reminds us both of how far God came for us and how "wide and long and high and deep is the love of Christ". We'd love to tell you of His love.